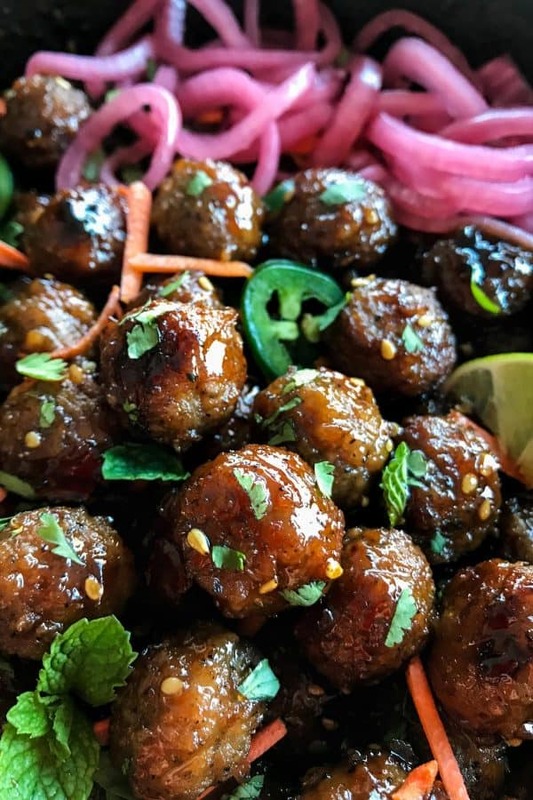 Bánh Mì, that classic Vietnamese sandwich that has me hooked with its pork-meets-fresh-meets-pickled goodness, takes a turn down easy street with this recipe for Banh Mi Meatballs. Enjoying these addictive flavors just doesn’t get any easier than this! 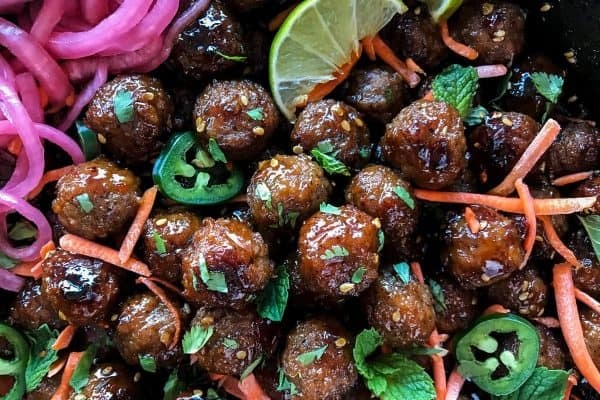 This banh mi meatballs recipe comes straight from the pages of Cast Iron Gourmet, written by my friend Megan of Country Cleaver. 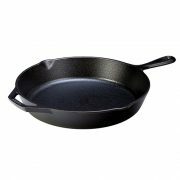 If you follow Megan, then you already know that she loves, loves, loves her cast iron skillets and cookware. 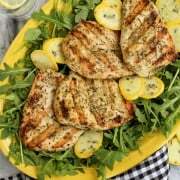 And she definitely knows her way around the kitchen, sharing fun recipes that are loaded with flavor and boast a beautiful presentation. 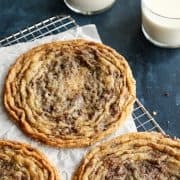 She has a way with her recipes that especially speak to people who are looking for gourmet dishes and flavors, but with simpler time-saving techniques and ingredients. 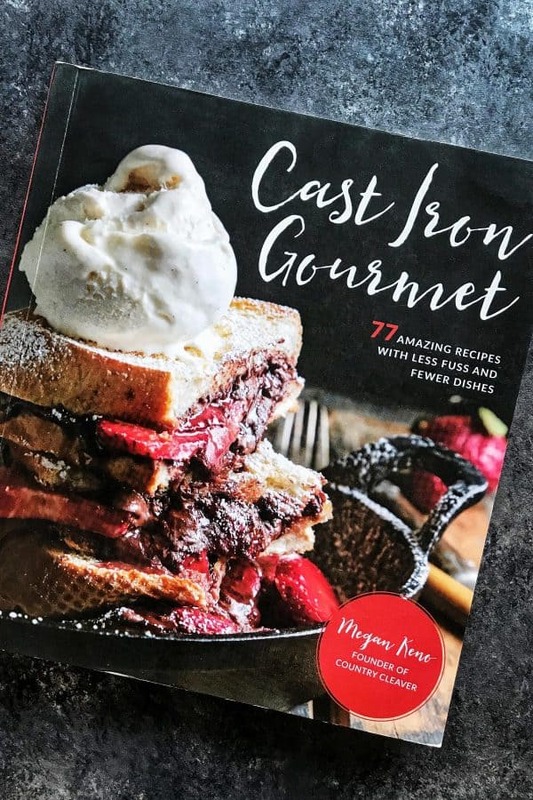 Cast Iron Gourmet is PACKED with deliciousness! 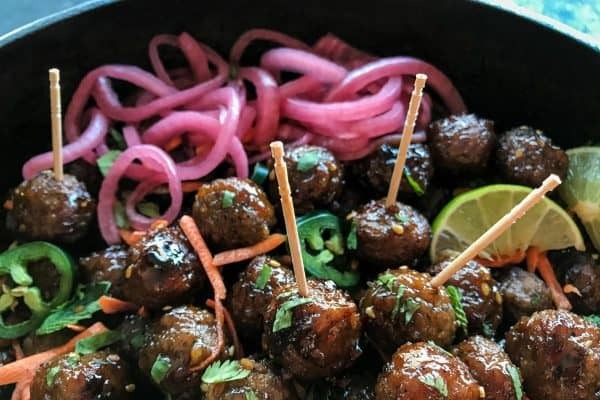 I like to use local Minnesota Simek’s mini pork meatballs when I make this recipe. A regular sized pork meatball would also be great. 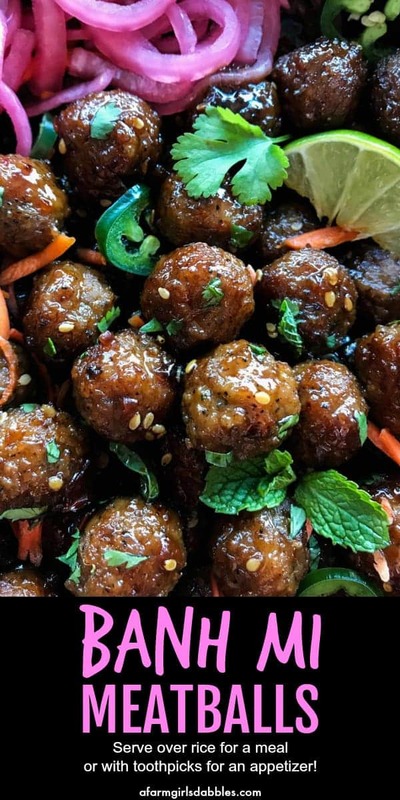 In her cookbook, Megan suggests that if you can’t find pork meatballs, just go ahead and substitute beef meatballs. 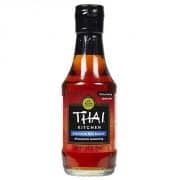 The flavorful sauce comes together super quickly and tastes fantastic. I promise you, you’ll be dipping your spoon in the sauce repeatedly, waiting for the meatballs to finish cooking. 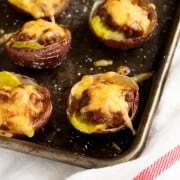 Serve them straight from the skillet with toothpicks, as an appetizer. Tuck them inside buns, similar to a classic bánh mì. Or serve them over rice, for a full-on meal. 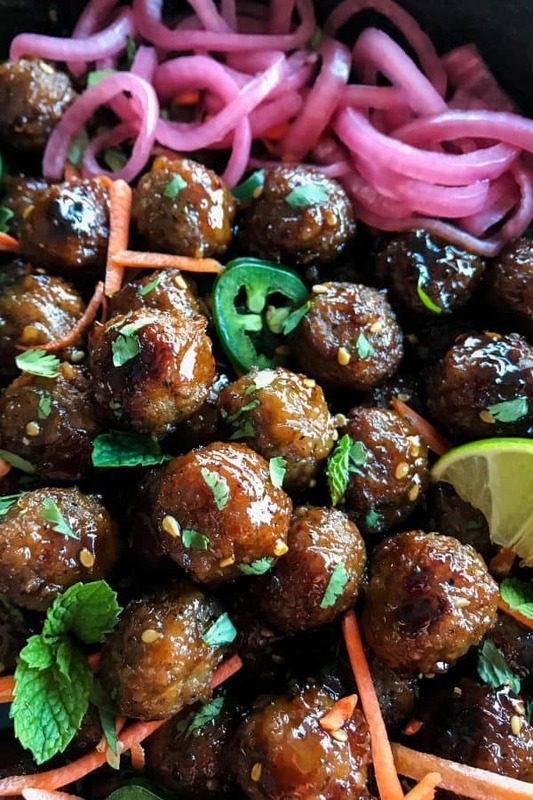 My version of this dish includes my nearly famous pickled red onions, plus fresh mint and lime. 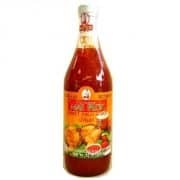 I just have to have these items whenever I enjoy bánh mì. I’m a total condiments girl. But these extras are definitely not necessary. Either way, I promise you’ll experience awesomeness. Like this banh mi recipe? Pin it! Heat 12″ cast iron skillet over medium heat. Add meatballs and cook for about 3 to 5 minutes, turning every minute or so. 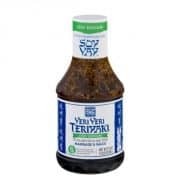 In a small bowl, combine sweet chili sauce, teriyaki sauce, and fish sauce. 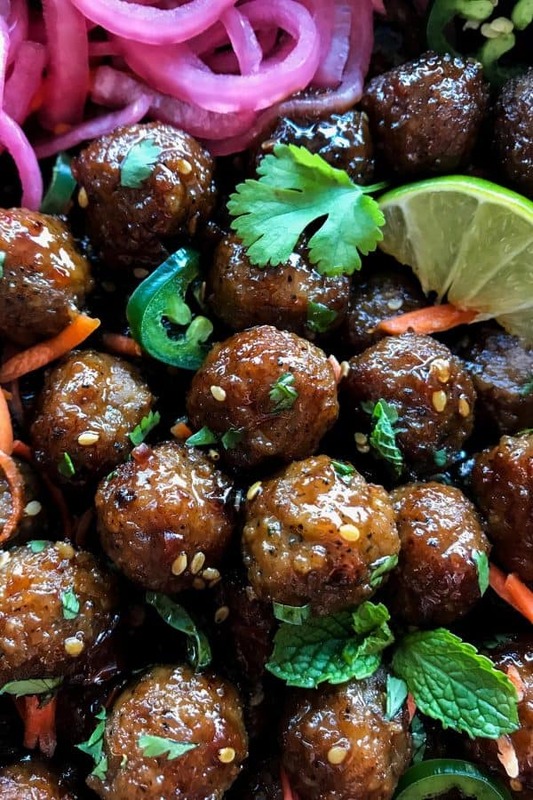 Pour sauce into skillet and toss meatballs to coat. 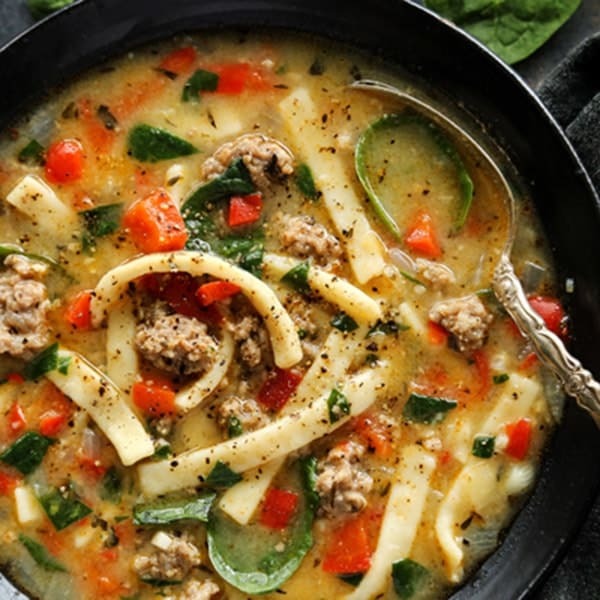 Cover skillet and let meatballs cook for about 10 minutes, until thoroughly warmed and meatballs reach 165° F, stirring every few minutes. 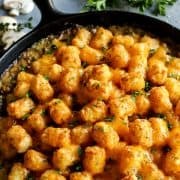 If you want to thicken the sauce a bit, uncover skillet and turn up heat to medium-high. Stir regularly until sauce is thickened to your liking. Remove skillet from heat and then scatter carrots, cilantro, and jalapeño over the top. 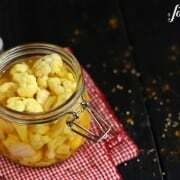 If you like, also sprinkle with fresh mint and serve with pickled red onions and lime wedges. 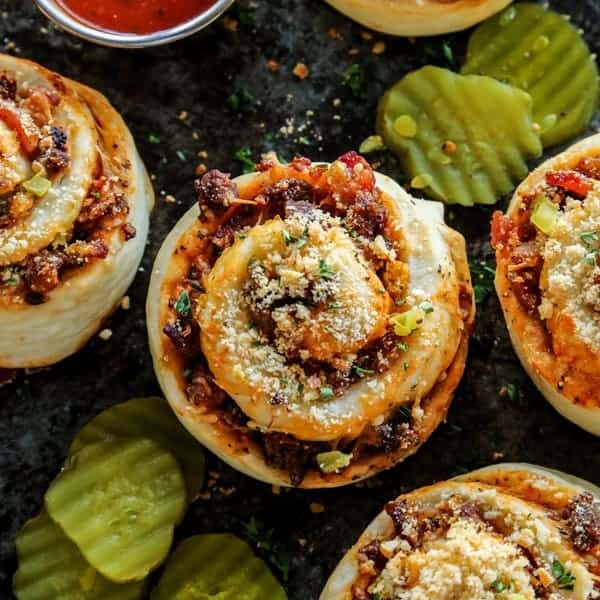 From Cast Iron Gourmet by Megan Keno of Country Cleaver. 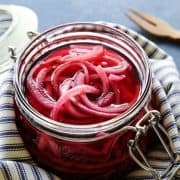 Any suggestions on how to pickled the red onion.I know how to pickled onions but want to know if you have special ingredients that will make the recipe special. Thanks. 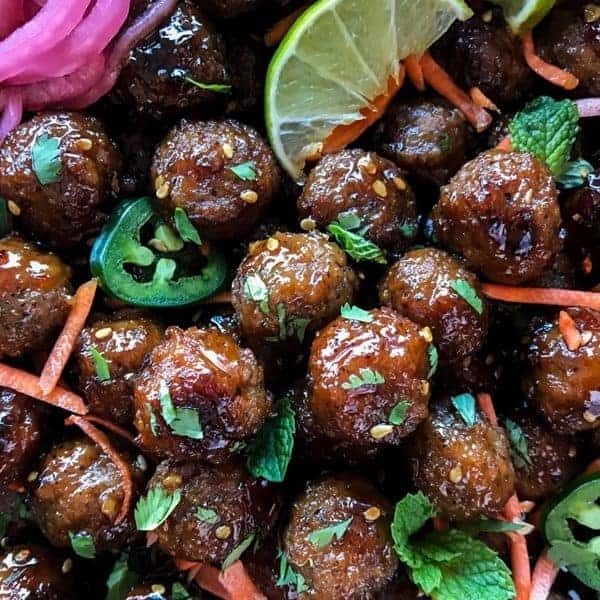 love meatballs, love jalapenos, love pickled red onions, and love these flavors, I’ve been looking for more recipes without bread, love banh mi but limiting my bread intake, so thank you for this recipe! Ooooh, baby, I love Bánh Mì sandwiches! 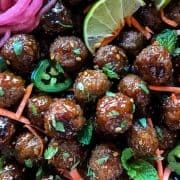 I can’t wait to try this meatball version, they look amazing! Banh Mi’s are the BOMB! And in meatballs version? YEAS. I need that book! Megan is the best!! 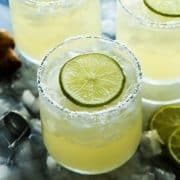 I constantly cook from her cookbook and definitely need to make these!! Brenda I am so pleased you liked these!! And with Super Bowl around the corner they are a GREAT appetizer!!! Ps your quick pickled onions are INSANE!! 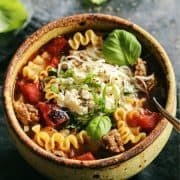 I use that recipe all the time!